Our hair is something that we all love to invest our time in, in order to look and feel fantastic. 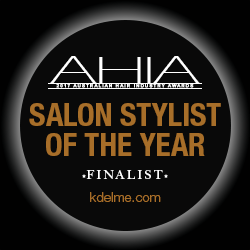 It is therefore essential that we are able to find a place in which we feel totally comfortable, where we have complete faith in the staff who ultimately hold our appearance in their hands, that’s our philosophy here at the Award winning KDelmé Hairdressing in Miranda, NSW. KDelmé Hairdressing has also achieved as part of its achievements, the status of a Preferred Salon for Great Lengths Hair Extensions, as well as a Session.Salon for Kevin.Murphy, having imagery from two different shoots highlighted on the two biggest hairdressing websites, as well as articles showcasing the salon in the Instyle Magazine and on the Bangstyle website. As our expertise has grown, so has our reputation, with staff from KDelmé Hairdressing being involved with American Crew for photo shoots and shows, Revlon Professional for shows and education, Kevin.Murphy for shows and also at shows for some well known fashion labels around the country. This continual drive from all the team is part of our commitment to provide our clients with the highest level of skills and expertise that we can provide, from best staff we can find. This is what KDelmé Hairdressing is about, providing the best we can with our specialties in services that we offer being Colour Correction, Progressive Cutting, Informal/Formal Styling, Great Lengths Hair Extensions and Keratin Treatments, with our product range that includes the world renowned hair care brands of Kevin.Murphy, Revlon Professional and Eleven. “Thank you Emma for my fantastic new hairstyle and colour. I haven’t stopped smiling. KDelmé, you have never failed me from the first time I walked in about 6 years ago and Kaarina first cut my hair, to today. One of the biggest issue we have within out industry is the huge amount of waste, these include things like loads of aluminium (foil and colour tubes), paper, cardboard, plastics (shampoo/conditioner bottles), excess chemicals and a lot of water. All these systems have allowed us also be recognised as a Green Select Salon by the AHC, which requires a standard to be achieved and maintained to achieve this accolade, which has only bee achieved by 25 salons nationally.